One of the best ways to determine housing affordability is to measure monthly housing costs versus income, otherwise known as your debt-to-income ratio (DTI). Lenders impose maximums to ensure borrowers can afford monthly payments. If too much of your income is going toward the mortgage, it can be said that your buying too much home, or simply that that property you have your eye on is unaffordable, to you. Over the past several years, this hasn’t been much of a problem because mortgage rates have been uncharacteristically low, and home prices have been on sale relative to recent highs. But that’s beginning to change. Thanks to several years of rising home prices and a sudden uptick in mortgage rates, income is now being eaten up by mortgage payments at the highest rate since 2010, this according to new research from Zillow. The company noted that prospective home buyers could now expect to set aside 15.8% of their income for mortgage payments, up from 14.7% a year earlier. While not a huge jump, it’s a trend that banks and lenders will need to keep an eye on to ensure we don’t sail toward another housing crisis. Generally, underwriters want that number to fall below 30%, so there is still quite a buffer nationally. However, that figure is based on numbers from the fourth quarter of 2016, so it might actually be a little bit worse today thanks to some upward movement in both rates and home prices since then. Additionally, it assumes the average buyer is putting down 20% and going with a 30-year fixed mortgage. In reality, not everyone is putting down 20%. In fact, many buyers are only putting down 3% thanks to the 97 LTV programs now available, or the classic 3.5% down required by the FHA. Still, the numbers are pretty low historically, well below the historic 21% spent on the monthly mortgage from 1985 through 2000. That means there’s plenty of room for both prices and rates to rise before a home purchase might be considered unaffordable. Of course, it varies by region as some areas of the country have experienced a lot more home price growth than others. 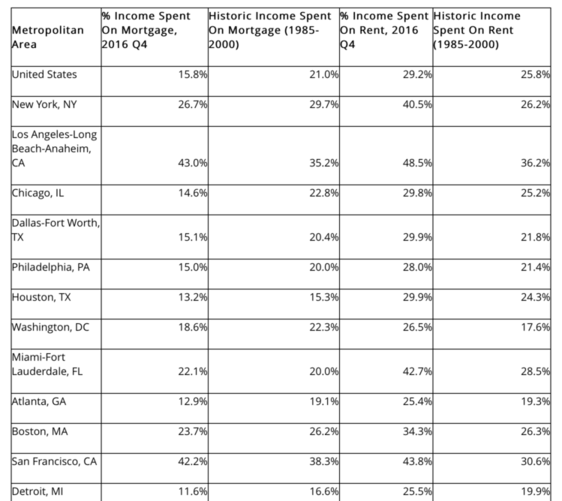 In seven metropolitan areas, income spent on the mortgage during Q4 2016 exceeded historic norms. If you look at that list, Los Angeles and San Jose seems to be the worst offenders. These are the metros where mortgage payments are costing homeowners the most relative to historic norms. 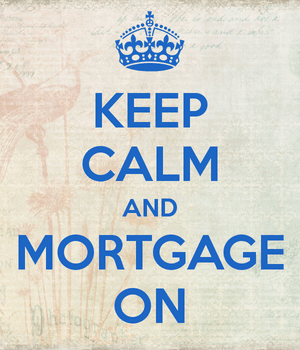 And at a time when mortgage rates are still close to record lows. That can’t be good, right? The rest of the metros covered by Zillow remain below their norms seen from 1985-2000, meaning they could still be considered affordable, despite any price jumps seen over the past few years. Perhaps more startling is the fact that rents are historically high in every single metro aside from Pittsburgh and Sacramento. This has made it tough for folks to make the transition from renting to owning – saving for a down payment is increasingly difficult when you can barely pay for rent each month. Nationwide, renters spent an average of 29.2% of their paycheck on rent each month, up from an average of 25.8% from 1985-2000. That makes it really tricky to navigate the current housing situation. Some people are probably forced to keep renting even though it’s less attractive than owning, but even owning isn’t that good of a deal in many areas anymore. But if it’s only expected to get more expensive, what can you do? Maybe hope you get paid more. It sounds like you did your part and got the appraisal and the LTV was below 80%. It does depend how long you’ve had the mortgage in some cases, but it looks like you’ve had for a while. You may want to get clarification about why exactly they won’t remove it. LTV too low doesn’t make sense…if anything, it’d be LTV too high.